Ladies and gentlemen, I’d like to introduce you to a pretty awesome individual. Because not only does this man have a seriously epic beard, but he is also about to embark upon a seriously epic challenge. Meet Jonathan; a man who doesn’t do things by halves, and a man who is committed to his cause. …hang on, I’d better stop myself right there and let Jonathan tell you the story for himself. As a man who loves an adventure, and in particular, an adventure with an interesting concept; everything about the ‘Orkney to Bournemouth’ challenge has had me buzzing with excitement. And when Jonathan first got in touch and told me about what he was doing, straight away it spoke out to me as being a story that had to be told. Not only is he going to be pushing his physical endurance and mental strength to the limits, but he’s doing this all in the name of charity. Please do wish Jonathan good luck, share this interview, and help him to make a difference. And one final word before we begin; Jonathan has actually broken a record here by making this the fastest ever interview that has been put together for the ‘people’ section. And his determination, excitement, and ever-present friendliness made this interview a joy to be involved with. Thank you Jonathan, and good luck! Elliot – Hi Jonathan. 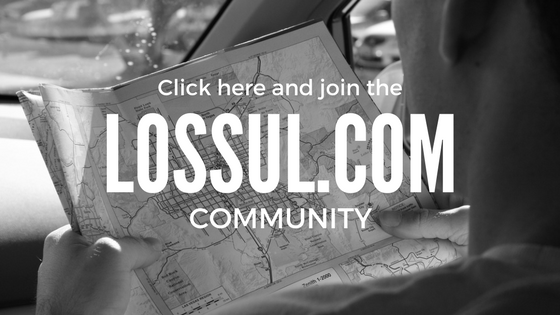 First of all, a huge welcome to you and thank you for being a part of Lossul.com. When you first got in touch and told me about the concept of what it is that you’re doing, straight away it felt like something that deserved a lot of support. I can’t wait to get this interview started and to help share your story! Could you please start off by giving us an overview of what it is that you’re doing, why you decided to do it, and also, what it is that you aim to achieve? Jonathan – Thank you for welcoming me into your community Elliot! 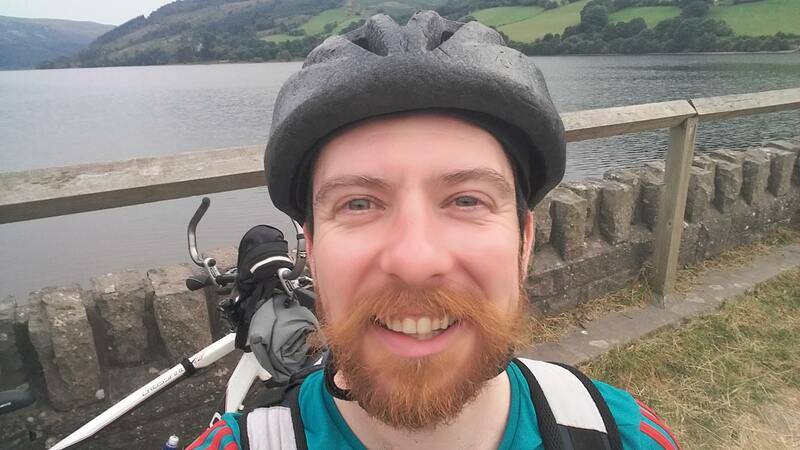 Throughout May, I’m going to be cycling from Orkney to Bournemouth, via John O’Groats and Lands’ End. It’s roughly 1500 miles I’m riding, solo and unsupported. 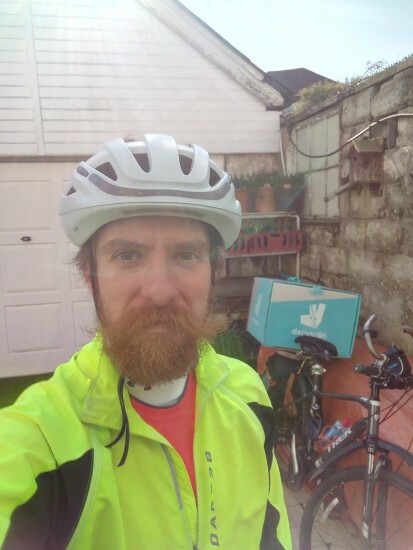 I’m doing this to raise money for a homelessness charity called Socks and Chocs, and Sustrans, who created and maintain the National Cycle Routes. Their routes fuelled my teenage rides and explorations, got me riding after injuries and have started me down this path, so I want to give something back. Homelessness is on the rise at the moment. Mental health issues on top of the economic climate are driving people on to the streets, and support from charities like Socks and Chocs is essential-not just for the practicalities, but also for much needed morale boosts. Having good friends and family have meant that I never needed a charity’s help, but not everyone has that safety net. That’s why I feel it is important to help. I’d like to be able to give my charities a pound per mile-it doesn’t just sound good, it means then that both charities will get a good result too. For myself, I get to explore places I’ve never been before, and stretch myself further than I ever have! Elliot – I really like that combination of the two charities there. With one, you’re helping to provide resources and opportunities to the people who need it most, and with the other, you’re giving back to something that has helped provide you with opportunities of your own. I really like that. 1500 miles is an impressive distance to cover, but what’s equally impressive is that you’re going to be undertaking this challenge alone and unsupported. How long do you anticipate the journey will take? And how to you go about preparing for a challenge like this, both physically and mentally? Jonathan – Ah, that is exactly what I was going for, so thank you. I do sometimes feel daunted by the distance-it is far more than anything I’ve ever done before! I look at the map of my route that I’ve made and just…wowsers! But mostly I’m excited, and May can’t come quickly enough. I’m anticipating a journey of roughly 20-30 days. That gives me time to enjoy the route, struggle through the route, and also do a little work en route, to keep me fed and watered. Because I have been so focused on the preparation and the gear I’ll be taking, the solitary part of the challenge hasn’t really hit home yet, and I know it is something that’ll confront me after a few days on the road. Britain feels like a crowded place to many people, and most of us live in an urban environment, but apparently about 93% of the country is not urban. That means a lot of spaces with very few people to bump into. I’ll be far from friends and family, and in many places, I’ll be without mobile signal, so no phone call home, or Facebook catch-up. Just myself, my bike and the trail. It sounds beautiful, but when the rain is being blown into my eyes after a long day of riding uphill into headwinds, I’ll be drawing on reserves that I have to trust will be there. That’s when the mental challenge will kick in. I’ve not often been by myself on a journey-the closest comparison that I can think of would have been a marathon I ran a few years ago. I was running with my sister in the Wales Marathon. Due to injury, she had to pull out around mile 15, so I was running at the back of the marathon by myself. It was mostly along country roads, with very few people around, with a lot of hills and I had never run a marathon distance before. I just had to dig deep, remember I was raising money for charity, so it wasn’t just about me. Take in the scenery, but watch the road for gravel or potholes. Breathe. Step. Watch my form and posture. Breath. Step. Just like then, if things get tough, I’ll focus on the important things-yet with it being a longer journey, I can also stop and rest, reflect on what I’m doing-and have a meal or a sleep if need be. For the physical side of things, I know that form is just as important in cycling as running; slouching or staying in one riding position for too long, is almost certain to result in an injury that could cause me issues. To combat that, I’ve extenders on my handlebars that allow me to alter my riding position, and I find these really useful at preventing neck strain. 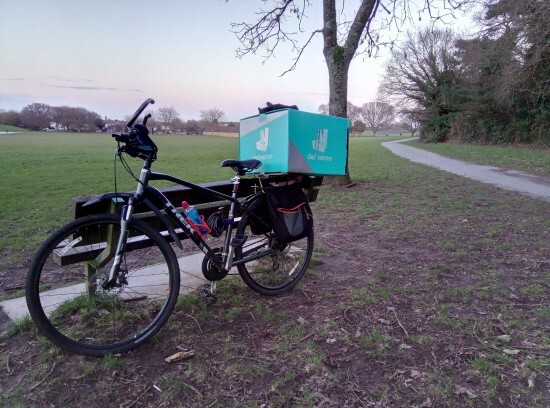 As a Deliveroo rider, I do cycle for a living, 20-40 miles most days, and usually 6 days a week. 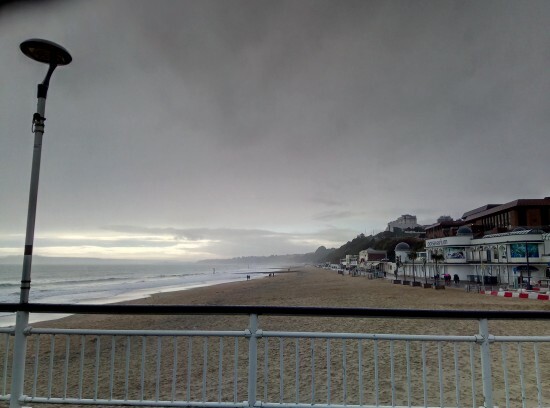 Bournemouth is quite up-and-down, and it seems the takeaways are all at the bottoms of the hills, with the customers all at the tops! 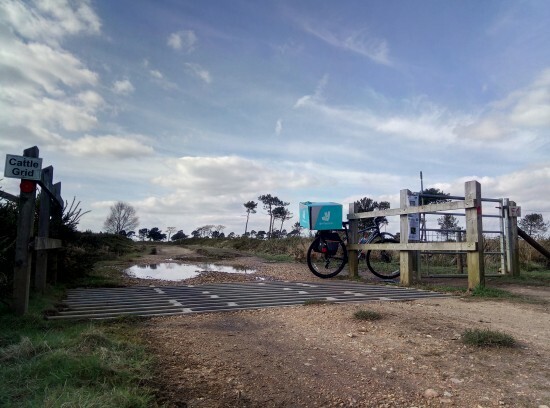 Of course, while that in itself is good training, I’ll be taking quite a bit more weight than the average takeaway can simulate, so for a little while now, I’ve been riding with some breeze blocks in panniers slung under my food box. This helps me prepare for the weight I’ll be carrying, and increases my stamina, hopefully to match what I’ll need to get me through the long days carrying my camping gear, clothes, water etc. I’m also doing the occasional bit of light weightlifting. Not enough that I’ll be top heavy, hah, but enough so that my fully laden bike won’t feel too heavy to move by hand. There are often places along bike trails that are fine for the average bike, but as soon as you get taller handlebars, wide bike boxes…well, then you need to manhandle things around corners or over rails. On top of that, I already know from long days at work that after a full day of cycling, you ache not just in your derriere and legs, but your abdomen, forearms and shoulders too. You always use more muscles than you think, especially when you are countering twisting movements, so a little extra strength should help stave off a few aches-at least, I hope so! Elliot – Riding 1500 miles is a huge undertaking in itself, but you’ll be carrying all your gear too which adds a whole other dimension to the challenge. It’s like a challenge within a challenge! But with your commitment to your preparation and with having what is clearly a strong positive mental attitude already, I’m sure that you will absolute smash this challenge! In no time at all you’ll be home with your feet up and thinking, what’s next? Like with any big challenge it will be a case of one step at a time (well, one pedal rotation at a time), with one hour becoming one day, and one day becoming one week, and so on. And with this in mind, what do you anticipate a typical day will look like for you on this challenge? And have you chosen where you’ll be stopping off and where you’ll be staying overnight, or is this something you’ll be making up as you go along? Jonathan – Aha, yes you’re quite right. Will it be the weight or the distance that makes me question my sanity first, I ask myself, hah! Thank you-I certainly like to think so too! I’ll answer the second part of your question first, if you don’t mind. For the majority of the trip, I am planning on wild camping so each night, the stop will be found on the fly. There will be the occasional use of a handy campsite, and if I am in a town or city, then a B and B may be more appropriate. Certainly, on those days when I get some Deliveroo work, I’ll be needing a room somewhere to safely keep all my luggage. There are also a few sights that I’ve earmarked for visiting, such as; Skara Brae in Orkney, the Iron Bridge of, aha, Iron Bridge, Glastonbury Tor…and the occasional brewery happens to be on the way as well! The sun wakes me in the morning, blazing down in a glorious fashion…oh wait a minute, I’m in Britain, let’s try again. The tapping of the rain on the roof above my head wakes me, as the light slowly pierces the mist and brightens my tent. Optimistic though I am, that sounds a bit more likely! A chilly and damp start to the day, so I quickly pull my clothes on and light my little stove, which is sheltered by a tarpaulin, but outside of my tent. Coffee and porridge time! Arrive late, Leave early, Leave No Trace! There’s still some drizzle coming down, but at least it isn’t snowing *crosses fingers*. I head back to the road from my secluded forest hideout, and start rolling along to pick up my route from where I left off. There seems to be a village about an hours’ ride away, so I’ll see if they have a village shop where I can pick up some bits for a sandwich, and then carry on. That’ll see me on the way for another couple of hours, but before that, there are some hills to climb. Slow and steady up hills, to save energy-I picked that tip up from an ultra runner, as it seems to hold true for endurance riding too. 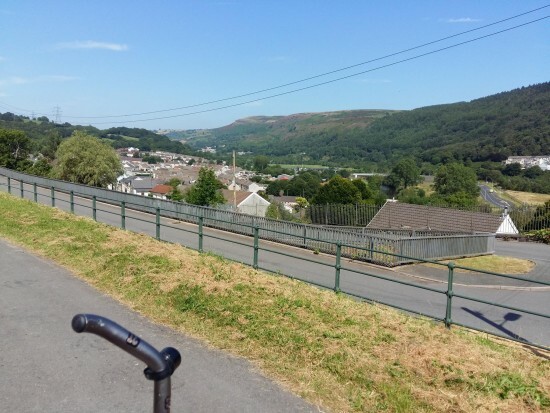 You save the fast pedalling for the downhills the other side-taking care because of the heavy load, but still-wheeeee! With that sandwich digested some time back, and about 15-20 miles done since then, I’m looking for a pub or cafe. A nice country place that’ll do me something filling, or maybe just a jacket potato. Thoughts of food are pretty constant, but I still stop to admire views-perhaps the sun shining along a road, a field recently planted, or mountains that I’ll be skirting, daring me to take a detour. With a midday meal inside me, and fluids topped up, I take my time leaving, perhaps chatting with locals about the area, and explaining why I’m so far from home. The road calls again though, so I take my leave. A slow and gentle ride on a full belly, eventually picking up the pace leaves me another 20 miles down the road and starting to feel hungry for more than just a cereal bar. With no shop or eatery in the last village, I find a likely place to pull over, and cook up a little bowl of pasta. It might not have much else in it, but hunger sauce makes any food appetising. With blood sugar levels restored for some clear thinking, I take stock of the day-how the gradients have affected my mileage. If this has been one of those days with lots more uphills than downhills, then even though I’ve “only” done 40-50 miles, I might be nearly at the end of the day. In which case, it’s time to take a look at my maps with a view to woodlands, and lakesides that might be good for setting up a camp. There may even be a bothy to hand-a semi abandoned building that the owner has agreed can be used overnight by those who need it. If it has been an easier day of it though, I may still have enough daylight to put an extra 20 miles or so behind me. There are long stretches of flat land in England, and parts of Scotland where I’ll be mostly be grinning my way downhill! So on these days I’m hoping to do 70 miles or so before setting up camp. Of course, all these estimates are subject to chance as well. Head and tailwinds will have their say, a bad night’s sleep, or rejuvenation after a rest day, will all add and subtract from my ideas of what I’ll do. Either way, the end of the day is coming, and the light is starting to dim. I’ve found a likely spot; just off the trail, an overlook with a picnic bench, a clearing behind it, and no one around for at least a few miles. I wait for the light to fade before setting up camp, but get my stove on the go again for a last nibble before bedtime-now where did I pack my spork this time?! There is no phone signal here, but while waiting for the light to fade, I take some photos, and write up my day. Now that the day is done, the clouds have cleared and the stars are coming out. Exercise then eating make for a sleepy Jonathan, so time for a well earned sleep-good night! Elliot – I’d be lying if I said that I weren’t feeling a pang of envy for the challenge you’re undertaking. Yes, it’s going to be incredibly hard work, but essentially you’re going to be a traveller, moving almost nomadically through Scotland and England, and ending each day in a brand new place. You’ll be like the Littlest Hobo; only taller, less hairy, and with two legs instead of four! And of all the places to mention, Skara Brae is actually right near the top of my must-see destinations, and as such, so are the Orkney Islands. I can’t wait to hear all about your adventures. While we’re on this subject, you mentioned that there are a number of destinations that you’ve ear-marked for visiting and you also mentioned wild camping. Is travelling something that you’ve always had an interest in? And how long have you been wild camping? Jonathan – Hahah, thank you! I now have the theme for The Littlest Hobo playing in my head-and no doubt will have for a while! You’re quite right though, I’ll be living the life of a nomad and have a new view with every breakfast! Tasty! Skara Brae is my first stop (barring the ferry over), and I’m hoping for it to be one of the highlights of my visit to Orkney-I’ll definitely be writing up my visit there. The same goes for my other “go to” destinations too, hopefully they’ll be interesting, amusing and something new for people to hear about. For most of my life, travelling has been one of those things that I would do someday. I’d do something fun and amazing… “Once I had enough money”, “Once those bills are paid off”, “Next year, when I’ve got enough holiday hours left”. 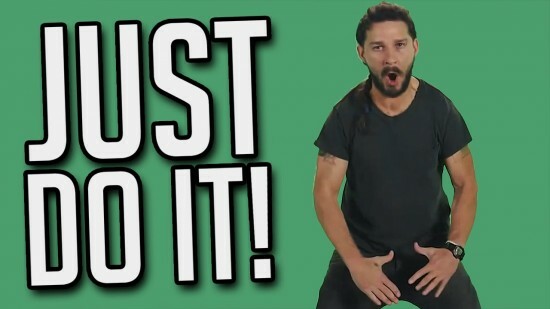 Some reasons are fair enough, but equally, unless you either Just Do It (thanks Shia LaBeouf!) spontaneously, then you need to organise and set a start date, or you may never get going. What got me kick-started was getting into running. A friend suggested I join him at a race. A past injury prompted me to consult a Dr, who suggested I “try it and see”. That went well, and I had fun entering Tough Mudder with a few friends and my sister, Joanne. 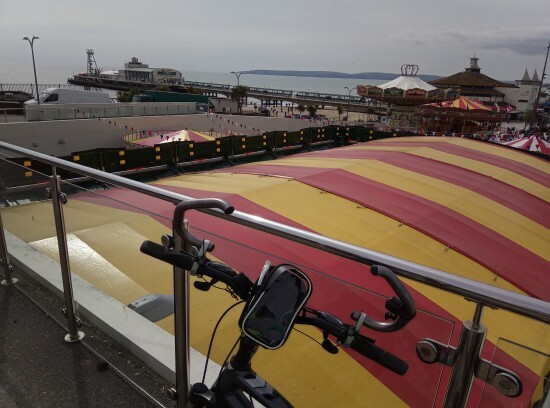 She encouraged me to join her in the Cardiff Half Marathon, taking place in October 2013 and I was clearly a very sensible boy at the time, as I decided before the race, to see if I could save a few pounds on the train from Bournemouth and…cycle there instead. Aha, I am not clever man! That ride in September started inauspiciously. Something broke just before I left, delaying me for a couple of hours. 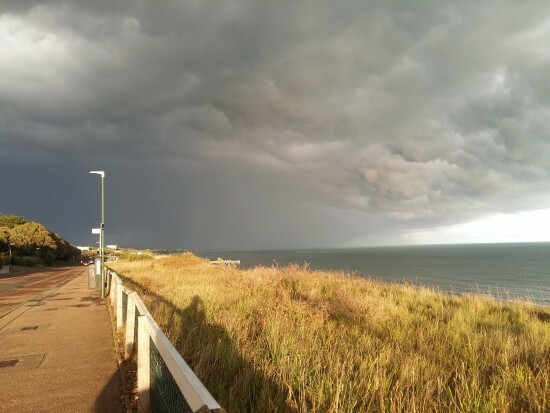 I then got lost before I’d left Bournemouth, adding more time onto my ride. As the day turned into night and as my parents, ever concerned for my health and safety, were staying up, I did allow my Dad to talk me into having a lift from Frome. For the return journey a few days later, I learnt from mistakes, and left at a more appropriate time. I loved that ride back. It was one of the most arduous things I’ve done to date-18 hours and 8 minutes, door to door. 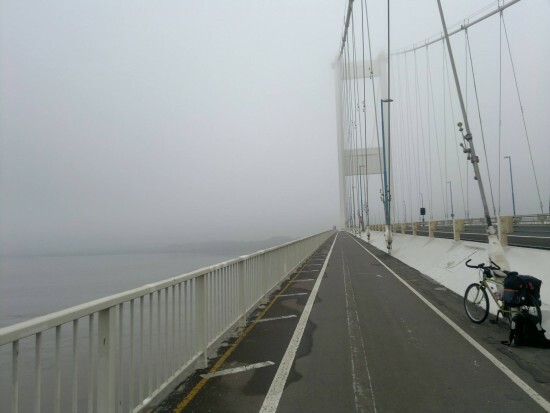 I got to cycle across the Old Severn Bridge, part of the lovely Bristol and Bath cycle path and so much more! It was about 115 miles, and for the last 2 hours, a bruised ankle tendon prevented me from cycling up hills. I was so pleased to get home at the end of the trip! It was wonderful…but I decided to catch the train for that race! Wild camping didn’t come on the scene until the following year. 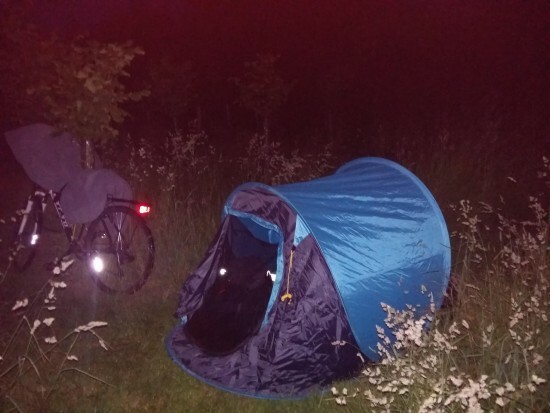 It’s actually thanks to Glastonbury Festival-while exploring there, I discovered a cyclists campsite, and an entire “Green Traveller” thing. Looking further into it, I discovered that if you cycled, you had your own entrance, and a hot shower! After seeing that, I just had to ride the following year which provided much consternation and amusement amongst my friends. I decided to leave around midnight, so that by my estimation, I would get there at the time the gates opened. I was successful and beat my friends who had driven there, aha! The following year, I rode again. This was to be a two-parter though, and was my first wild camping experience. I recall arriving at the first likely location, but feeling it was a little too exposed and too early, decided to press on to the woods I’d marked as a 2nd location. Night was falling when I arrived, and it did look dense enough-but a bit too dense. 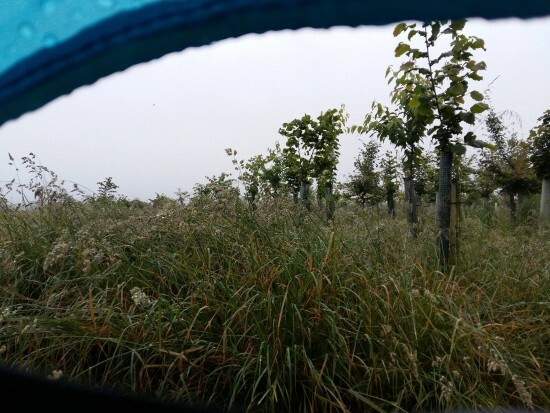 I couldn’t get at the woodland, as the road around it was 4 foot or more above the forest floor, and all the banks overgrown to a degree that would require tools to get through. By this point, tiredness was setting in, and I was getting discouraged. With two likely spots discarded, and nothing good on the map, I started to think I might end up on the roadside. Luckily, I got an upgrade to that. I found a long disused field entrance, the gate set back from the road, with an overgrown concrete paving leading to it. Hedged on one side, I could see no lights at the other, and as the gate and drive clearly hadn’t been used for a few years, I decided to risk it. The June sunshine woke me early, showing me a farmhouse a couple of fields away, so I packed up quickly to continue my journey. I don’t think anyone knew I was there, which is just right-Leave No Trace. I have been able to follow a similar pattern on subsequent trips to the area, with a favoured woodland now scouted out. As my family no longer live in that area, I wanted to make a proper nostalgia trip. I visited some friends in Cardiff the night before, and then in the morning caught the “Bay Bus”, a ferry down the Taff river to Cardiff Bay. 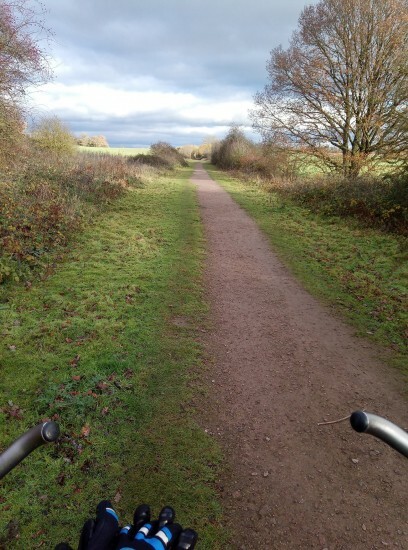 From there I picked up the trail out of Cardiff, along the same route that I used to ride to uni on. I popped in to say hello to an Aunt, then took a detour from the trail to go up the Garth Mountain. Not sure that it is really a mountain, but in August, it is too hot to ride and push a bike up steep slopes like that! Alas, that hot climb up the Garth had taken so much out of me that I gave in and plumped for a B and B, so the wild camping plans there fell through-and the tent carried for naught! Still, it was the right decision-and is part of what led me to decide to do Orkney to Bournemouth at this time of year. Writing this has clarified how each experience has been built on the strengths I’ve gained, and the mistakes I’ve made on each trip. A sense of “well I’ve done that, so I can do this!” I’m also better at planning and more relaxed about things going wrong. Elliot – I know that feeling extremely well. Whenever I get home from a weekend of wild camping or from having been away travelling, the first thing I do is un-pack my bag, take a hot shower, and have a cup of tea. But as I stand there, sipping on my drink, I’ll feel the calling. And then I have to start planning the next trip. With that in mind, so far we’ve talked about the challenge, your preparation, and how you anticipate the days unfolding. But when the journey finally comes to an end and your bicycle comes to a stop on your garden path, what happens next? From that moment when you reach home, how do you imagine you’ll be feeling? And what do you plan on doing during those first 24 hours of being home? Jonathan – Oho, now let’s see! The familiar sounds and smells will definitely give me a warm “home” feeling. A touch of relief that I won’t be woken up early by rain/sun/wild animals/passing traffic, will be tempered with disappointment that I don’t have a journey to attend to. But then, I’ll have friends to see, that I won’t have seen for weeks. I think I’ll feel quite up and down for a little while! Speaking of friends; when I do arrive back, I would like to meet up with them and go for a meal- maybe an “all you can eat” type place, so I can eat and eat! I’ll have a good shower before that, of course! Yes, I think the first day of being back will be chilling and chatting, catching up with friends, speaking to family, and basking in the positive elements of being home. The end of the day I’ll lie in bed and reflect on what I’ve just completed, without thinking toooo much about a sequel. Elliot – Not thinking toooo much about a sequel, but maybe just thinking a liiiittle bit about a sequel, huh? You do realise that this could be the opening of the Pandora’s Box of adventures and I’d certainly be interested in hearing about whatever challenge comes next. Well I’ve no doubt that the readers would love to hear how you’re getting on once the journey begins in May, so would you like to take an opportunity to let us all know how we can best keep tabs on the rest of your preparation and on the duration of the journey itself? Jonathan – Oho, I think I already hear Gallic whispers coming from Pandora’s box! I’ll let you know how that goes, down the line! Thanks Elliot, I’d be happy to. To begin with, I’m keeping an active blog of my preparation, updated at least weekly at the moment. As I set off, and my journey unfolds, that will have more frequent updates showcasing the interesting places I have visited, or milestones that I have reached. You can find that by clicking here and if you’d like to know when I have posted something new, just sign up to the mailing list on the right hand side of the blog page. Also on all platforms, I’m using the hashtag #OrkneyToBournemouth which should be easier on the memory-and you can also use that to search for my public posts on Facebook too. Once I get to Bournemouth there will still be some wrapping up to do, charity related fun and reflections on the journey, so you’ll be able to keep up to date for the full duration. Elliot – The more I read about your challenge, the more excited I’m getting about it. It’s going to be great to follow you while you’re on the road but then I’d also love the hear more about the charity related fun when you’re back and also your reflections on the trip. Please do keep us all updated. You mentioned at the start of this interview that this will be a sponsored challenge with the donations going to the Socks and Chocs and Sustrans charities. Could you please now tell us more about your sponsorship targets and also how people can help, either in terms of the sponsorship target or with the challenge itself? Jonathan – Writing about it has been bringing a grin to my face too, I’m glad to hear it’s being passed on! Thanks! I am hoping to raise £1500. The route is roughly 1500 miles, so hitting that target will work out like a pound per mile-and I’m hoping that the kind people who sponsor me will realise that I’ll feel that too! I’ll be carrying all my luggage over those 1500 miles, but one part of that luggage will be a little special. While in Orkney, I’m going to be visiting the generous Viking folk of Britain’s most northerly distillery, Highland Park. They have kindly donated a bottle of their 12 year Old “Viking Honour” whisky, which I’ll be transporting all the way to Bournemouth, there to raffle off, and hand deliver to a lucky sponsor. And provide contact details so I can let you know you’ve won! As to other ways of helping, any sharing you can do will be gratefully appreciated, spreading the word about #OrkneyToBournemouth, so that others can find my challenge, and perhaps be inspired to challenge themselves-hopefully inspired to donate to the charities I’m fundraising for too! There is one more thing that I am hoping to do as part of the ride. It is not firm as yet (cutting it fine I know! ), so I don’t want to go into any details in case it falls through. But as a little clue-I’m hoping that “May the Fourth” will be with me..! Keep an eye on my blog for that date if you are intrigued! Elliot – Well who could resist making a donation! I mean, on one hand they’re providing much needed support to two worthy charities, and on the other hand there’s a chance to win a bottle of Highland Park whisky. I love Highland Park! Jonathan, this has been such a great interview which has come together so quickly. In fact between us we’ve actually set a new record for the being the fastest interview put together here on Lossul.com. Thank you for being so committed to getting this done! Well sadly we now have to bring this to a close, but as tradition has it, we have one last question to go. I don’t know if you’re already aware but every interview always ends with a totally random and completely off-topic question, but this time I’m going to keep it relevant to the Orkney to Bournemouth challenge. So, imagine that you’re on the challenge and on one particular day (who knows, maybe it could even be May the Fourth) you could pick anybody in the entire world to cycle alongside you for the full day. Who would it be, and why would you choose them? Jonathan – I know, right? Who doesn’t like winning as part of a good cause? I’ve yet to try Highland Park myself, looking forward to it-and, I’ll pass on your love for their whisky to the distillers when I see them! Thank you Elliot. It has been fun to write it with you, and have been on tenterhooks for each new question. While I’ve looked forward to each question, I was wondering what you might have in store for me for the random question-and it’s a good one! So I had a think about this-I’m never good at thinking of people off the top of my head. I thought of a few actors and wotnot, but while I’m sure they’d be interesting, I wasn’t “grabbed”. But there is someone whose exploits I’ve followed for a couple of years on Facebook, who I think would be a very interesting and entertaining cycling companion. Ishbel Holmes, also known as World Bike Girl, has spent most of the last 3 years travelling the world, on top of her prior adventures. Having most recently cycled throughout South America, I think a bike ride with her would be full of anecdotes and no doubt educational too! En route, she worked with a number of local animal shelters and groups, and has saved quite a lot of street dogs, two of whom she has managed to bring back to the UK just this year. As an inspiration to go further, push yourself and do more good in the world, I just don’t think you can get much better! Thank you everybody for taking the time to read this interview. I’m sure you would agree with me that Jonathan deserves lots of support on his challenge; whether that’s by making a donation through his Virgin Money Giving page, or helping to spread the word by using the #OrkneyToBournemouth hashtag or by sharing this interview on social media. If you’d like to keep up to date with Jonathan’s preparations and also the journey itself, then please do check out his website and sign up to the blog. I’ve signed up myself and his posts have certainly been entertaining! Please also feel free to leave any useful comments and good luck wishes for Jonathan below.